Free State jumped out to a 14-0 lead in the first quarter as Jordan Preston connected on touchdown passes to Cole Phillips and Keenan Garber. After Park Hill forced Free State into a safety in the second quarter, the Firebirds responded with a touchdown pass from Preston to Jake Rittman just before half and a 21-2 lead. But Park Hill quarterback Billy Maples would bring the Trojans back. Maples, who entered the game with 21 touchdown passes without an interception, tossed a pair of fourth-quarter scoring strikes to Ronnie Bell to pull the Trojans to within 21-16. Park Hill would mount one last drive late in the fourth quarter. Facing fourth down at the Free State 35, Maples faced pressure from Free State linebacker Jax Dineen and Kwinton Lassiter broke up Maples pass to secure the Firebird victory. Overall last season, Missouri schools went 15-0 against Kansas schools in Week 3. 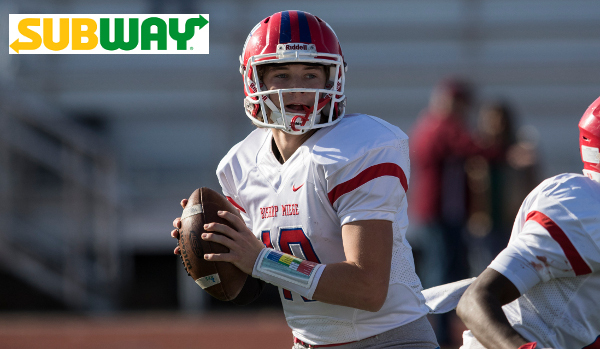 This season, Kansas secured two wins in the Sunflower-Suburban Showdown, but Missouri still went 12-2 on Friday night with one game still scheduled to be played on Saturday. There will likely be a new No. 1 in Class 6A again next week as Rockhurst (Mo.) scored a fourth-quarter touchdown to top Shawnee Mission East, 21-17. Brady McCanles scored the go-ahead touchdown in the fourth quarter, his third of the game, to give the Hawklets the win. Rockhurst took a 14-3 lead in the first half before the Lancers responded. Milton Braasch scored on a short touchdown run to pull East within 14-10. Shawnee Mission East would take the lead in the third quarter as quarterback Andy Maddox’s two-yard run put the Lancers up 17-14. Milton Braasch rushed for more than 155 yards and a score to lead the Lancers. Last season, Shawnee Mission East dominated the matchup statistically, but turnovers hurt the Lancers and allowed Rockhurst to pull out a 26-20 victory. In a battle of two of the state’s top teams, Class 4A-I’s top-ranked Bishop Miege Stags held off Class 5A’s No. 1 St. Thomas Aquinas Saints 27-14. Bishop Miege took a 13-7 lead into halftime on a pair of Carter Putz touchdown runs, and each time the Saints looked to grab the momentum in the second half, the Stags would regain control with a big play. An Aquinas punt pinned Miege at its own 2-yard line in the third quarter, but Putz promptly hit Daniel Jackson on a 98-yard touchdown pass to put the Stags up 20-7. The touchdown pass was the 93rd of Putz’s career, breaking the Kansas state record held by Silver Lake’s Shannon Kruger. Aquinas would drive inside the Miege 15-yard line on the ensuing drive, but the Stag defense would stop the Saints on a 4th-and-1 to end the threat. The Saints would get the ball back and pull within 20-14 on a Camron Jackson 14-yard run with 6:28 remaining. But on the ensuing drive, Miege would essentially put the game out of reach as sophomore Brison Cobbins took a handoff and went untouched 59 yards for a touchdown and a 27-14 lead. Aquinas would threaten one more time, but the Stags would recover a Saints fumbled toss at the 4-yard line. Putz finished with 230 passing yards and a touchdown, while rushing for two more scores. Jackson caught four passes for 186 yards and the long touchdown, and Cobbins totaled 133 yards on the ground. De Soto rolled to a 41-0 win over Frontier League rival Louisburg in matchup voted as Game of the Week by the Kpreps fan poll. De Soto took control with a commanding first quarter that saw the Wildcats build a 21-0 lead. Senior Braydon Brummer scooped up a Louisburg fumble and returned if for a touchdown, and Wildcat quarterback Bryce Mohl added a touchdown run for a 14-0 lead. Mohl then hit Connor Strouse on a touchdown pass to extend the lead to 21-0, and Mohl’s second rushing score put De Soto up 28-0 at halftime. Trevor Watts and Leo Oplotnick added touchdown runs in the second half as De Soto cruised to a third consecutive win. The Wildcat defense has now posted consecutive shutouts and has given up only eight points all season. Louisburg won last year’s meeting 31-17. Buhler, ranked No. 5 in Class 4A-I, rushed for nearly 500 yards in dismantling Wichita Collegiate, 47-21. Dalton Brown rushed for 305 yards and four touchdowns as the Crusaders dominated the Spartans up front. Collegiate had held Buhler to less than 100 yards rushing in a 45-21 Spartan win last season. Brown’s two first-half touchdowns and a Dalton Smyres touchdown reception from Ben Epp put the Crusaders up 21-7 at halftime. The lead grew to 27-7 entering the fourth quarter on a Jett Burkhart touchdown run. Collegiate pulled to within 27-14 on a long touchdown pass from Cody McNerney to Grant Morrow, but Brown would tack a pair of long touchdown runs to put Buhler up 41-14. McNerney passed for more than 250 yards and a pair of touchdowns to lead the Spartans. Buhler travels to unbeaten Maize South next week, while Collegiate will be on the road against Mulvane (2-1). The Seaman Vikings forced four Topeka Hayden turnovers in besting the Wildcats 17-6 in a Centennial League game on Friday. Kobe Jones’ touchdown gave Seaman an early 7-0 lead and would end up being all that the Vikings would need. Brock Hillebert added a field goal for a 10-0 Viking lead in the second quarter. Hayden responded with a short touchdown run by quarterback Sampson Huston late in the first half to pull within 10-6. It would stay a four-point game until Jones connected with Sam Payne on a touchdown pass for a 17-6 lead. Hayden would outgain Seaman in total yardage, but lost two fumbles and threw a pair of interceptions. Blue Valley scored 10 points in the final 1:06 of the game to shock 6A No. 4 Blue Valley North, 34-33. Jackson Likens connected on a 27-yard field goal with 15 second remaining to give the Tigers the 34-33 win. The Tigers trailed 33-24 until Luke Bernard connected with Blake Brown on a touchdown pass to pull Blue Valley to within 33-31. Likens then successfully kicked an onside kick to give the Tigers a chance, and later converted the winning field goal. Blue Valley North led 19-3 at halftime, but consecutive touchdown passes from Bernard to Cade Green and Brown pulled the Tigers within 19-17 after three quarters. The Mustangs would extend the lead to 26-17 on a touchdown with 9:30 remaining, but Bernard would hit Alex Totta on a touchdown pass to pull Blue Valley within 26-24. North regained a two-score lead, 33-24, on a touchdown with 3:02 remaining. It may not have had the dramatics of last season’s 43-42 thriller, but Nemaha Central beat Holton for a second straight season with a 30-18 win on Friday night. Nemaha Central jumped out to a 21-0 lead early in the second quarter thanks to big plays by the Thunder special teams and defense. Noah Gauna blocked an early Holton punt and returned it for a touchdown for an early 7-0 lead. Mitchell Henry added a touchdown run in the first quarter for a 14-0 lead, and then picked off a Holton pass at midfield and returned it for a touchdown to give the Thunder a three-score advantage. Holton would respond with a Mason Strader touchdown pass to A.J. Haussler to close within 21-8. The Wildcats would later add a field goal to pull within 21-11 at half. Nemaha Central took a 27-11 lead in the third quarter on a Henry touchdown run, and added a Caleb Henry field goal in the fourth quarter for a 30-11 lead. In a game expected to go a long way in deciding the Central Kansas League title and the pecking order of the western favorite in Class 4A-II, defending champion Pratt built a 28-0 lead and held on to top Nickerson, 28-14. Travis Theis rushed for four touchdowns as Pratt extended its 21-0 halftime lead to 28-0 in the third quarter. Nickerson would respond with a touchdown pass from Josh Salazar to Trystan Isley to pull within 28-7. Later, Salazar’s touchdown run on the final play of the third quarter brought the Panthers back to within 28-14. Junior quarterback K’Vonte Baker rushed for 428 yards and eight touchdowns on only 12 carries as Wichita Heights throttled Dodge City, 65-0. Heights was originally tabbed as the No. 3 team in the Kpreps Class 5A poll, but stumbled to an 0-2 start after the Falcon’s entire backfield was suspended for the first two games of the season. Wichita Heights opened with a 39-25 loss at Olathe North before falling to Wichita Northwest 37-20 last week. The Falcons’ potential to become a 5A state title contender was certainly on display on Friday with Baker’s return. He had highlight-reel touchdown runs of 60, 70, and 90 yards in the game. Baker also completed three of four passes for 55 yards, leaving him just 17 yards shy of putting up 500 yards of total offense by himself on Friday night. Baker earned Kpreps Class 5A All-State honors as a sophomore last season after rushing for 1,469 yards and 21 touchdowns. South Central senior Zach Jellison scored his first career touchdown on Friday in the Timberwolves win over Ingalls. Jellison, born with spina bifida, has been an integral part of the Timberwolves basketball and football program throughout his high school career. Jellison was helped into the end zone on his touchdown by his cousin, Hunter Huck. South Central won the game 53-6. Congratulations to the Altoona-Midway Jets for snapping a 28-game losing streak with a 44-26 victory over Chetopa. The Jets last victory came on October 27, 2011 with a 45-24 win over Tyro Christian. The Jets also defeated Tyro Christian in 2010, but their last win over a KSHSAA-sanctioned opponent came on October 9, 2009 with a 6-0 shutout of Chetopa. Altoona-Midway did not field a team for the 2012 or 2013 seasons.